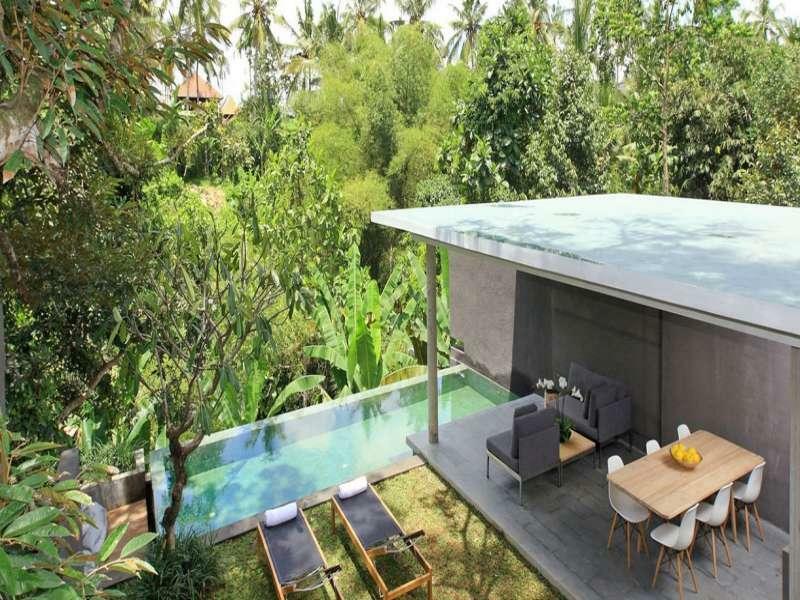 Имате въпрос към Aria Villas Ubud? При посещение в Бали, в Aria Villas Ubud ще се почувствате като у дома си, защото предлага квалитетно настаняване и отлично обслужване. Хотелът се намира на 0.5 km от центъра на града и осигурява достъп до важните места на града. С удобното си местоположение хотелът предлага лесен достъп до всички градски забележителности, които задължително трябва да се видят. В Aria Villas Ubud отличното обслужване и достъпните съоръжения допринасят за Вашия незабравим престой. Подбор на съоръжения от най-висока класа като пощенски услуги, ежедневно почистване, безплатен WiFi достъп във всички стаи, 24-часова рецепция, експресно настаняване/напускане, са на разположение за Вас в хотела. Гостите на хотела могат да изберат една от 8 стаи, в които се усеща атмосферата на спокойствие и хармония. Възможностите за отдих, които хотелът предлага са открит басейн, спа, които също предоставят бягство от ежедневието и предразполагат за пълна почивка. Aria Villas Ubud е добър избор за всички посетители на Бали, защото предлага спокойствие и безпроблемен престой. It’s amazing how it felt like miles away from the center despite the fact that it’s just meters away. I also love how the shuttle is free back and forth to ubud market area. An area to improve on though is their AC-it was extremely hot. They did say that it was bec of the weather but I personally think that they must be prepared for it. They did make it up to us by providing a fan. Good thing we got our room for a really affordable price otherwise paying for the real rate would’ve been a big issue given the AC problem. But over-all it was a great experience in Aria Villa! 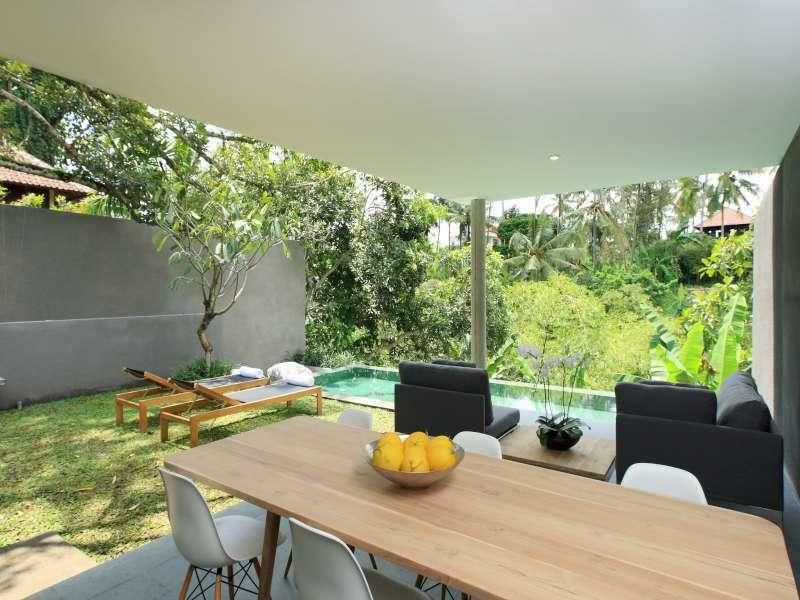 Well-decorated, clean and private space amidst lush greenery. Staff were polite and non-intrusive. Villa has services like massage and good quality food, which means you never have to leave the place if you want a nice retreat. There are some bugs but they are not a huge disturbance once you get used to them. Balik does wonderful massages, and she's highly recommended if you do stay at this place. Spent three nights in Aria. Greeted by the charismatic Rudy from the front desk. Loved the room and the en suite bathroom is spacious. Nice open shower facilities. The bathtub though is tucked amongst pretty lush greenery so you have to be on really good terms with nature and like crawling or flying friends . One complaint though is the TV is fixed on a wall that is not in front of the bed. Hence, laying on the bed while TV surfing is hardly an option. Room service is top notch in Aria. The cleaning staff is almost intuitive. When you return to your room after a day out, you’ll be greeted by traditional cakes on the table, made up bed, fresh towels and some insect repellent device. 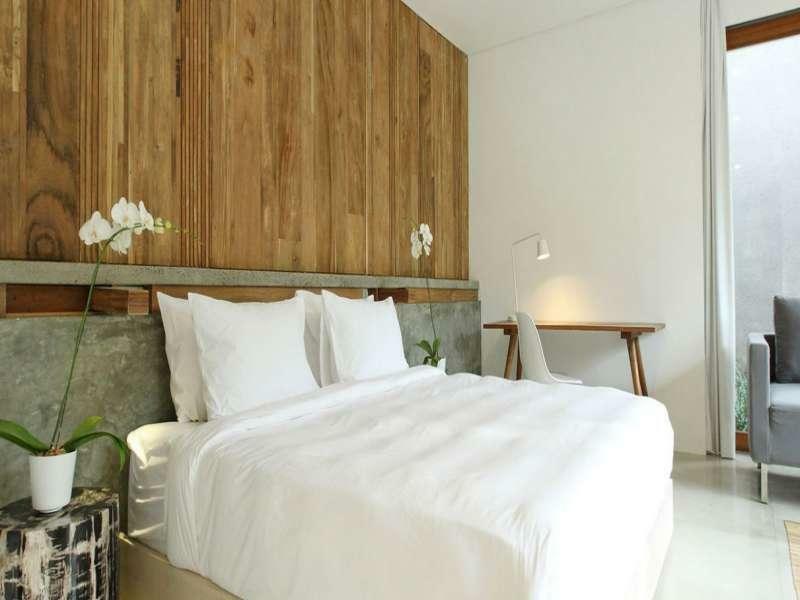 Breakfast will be sent to the room every morning and the spread is really good In terms of location, Aria is a 10 minute walk from Ubud Centre. We enjoyed how Bali Buda and Radiantly Alive are just around the corner after the walk down the road. Gives a good exercise though. Aria provides shuttle service which is pretty great if you are feeling lazy. Ok so overall, decent stay in Aria. Would return and will definitely recommend to friends looking to stay in Ubud. The place the staff everything was just too good.Though I have stayed in so many 5star and 7start hotels in India and in other European countries it was the best stay of my life. We loved this place! We were travelling with a 7 month baby and the staff did their utmost for our convenience. They even prepared vegatable purees for our baby when we ran out of baby foods; amazing service! The food is great, breakfast was perfect and just a short 5min walk to ubud center. We stayed in the villa a lot, enjoying the quiteness, the pool and the surounding, which is green and beautiful. Will definitely stay here again, big recommendation! Thank you Made, Rudy and all of the other staff! the staff were fabulous, the villa was beautiful and our stay was so relaxing. we had a great time, and will be back next time we visit ubud. we have stayed in quite a few places in ubud but this was out favorite! 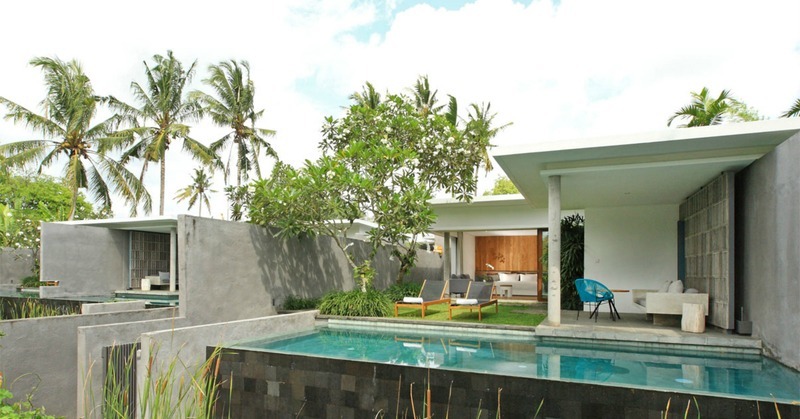 Beautiful modern villas with the pool overlooking lush greenery. Staff were lovely, went above and beyond to ensure we had everything we need. Scooters available to hire and just a 10 minute walk to the centre of town. The design of the villa as unique, private, modern and had the rustic feel. Villa was very clean, staff were Super friendly and approachable. Pool was big and good, and it was just lovely chilling at the sun bed. Room was clean and service was good. They even surprised us with a honeymoon cake! Definitely worth coming back. 2 thumbs up!! Service is attentive and considerate. There are a total of 8 villas in Aria Villas Ubud so the guest service manager and front desk basically know every customer by heart. Say knowing customer doesn't only refer to knowing our name, the team remember our preference, and reach out to make sure our needs are happily fulfilled and feel like home. What more can we ask for in a hotel? To add on, the Aria signature in villa massage is a must try. Feel like heaven! The daily special dinner is nothing substandard to Michelin star restaurant but with very very affordable price. Highly recommended and definitely will come back to see the lovely team! Pros: location to citycenter, modern minimalist amenities and design, private and secluded enough for couple, private pool Cons: weak wifi (on/off and when on, quite slow), weak water heater (hot water cool down very fast), somewhat cold in room breakfast spread (prepared beforehand, with delivery timing and all it arrived just lukewarm. Disappointed). We love the clean pool ,the view, love to have breakfast at the poolside, if you looking for privacy, this is the right place for you. Love the cement touch for the bathroom took !! And the breakfast is so delicious! Love the Nasi goreng, I ordered a few time during my stay!! Enjoyed our stay at Aria Villas Ubud thoroughly. The villa was very well-maintained and the pool was nicely sized for afternoons of relaxation. The villas are well appointed and private. The most important thing was that the service was excellent and friendly. We felt very welcome and would return again. The only issue is that the villa is a tad far up a hill for walking (especially with the lack of foot paths or space on the narrow road up to the villa) but this was not insurmountable as the staff were very efficient in arranging for our transport out of the villa at every moment. We stay at pool villa no. 3 which is a very nice villa with a big private pool. We have breakfast served inside our private villa by the pool so we barely have to move ourselves out of the villa. The location is very close to city center and can easily reached by private car with a local driver. 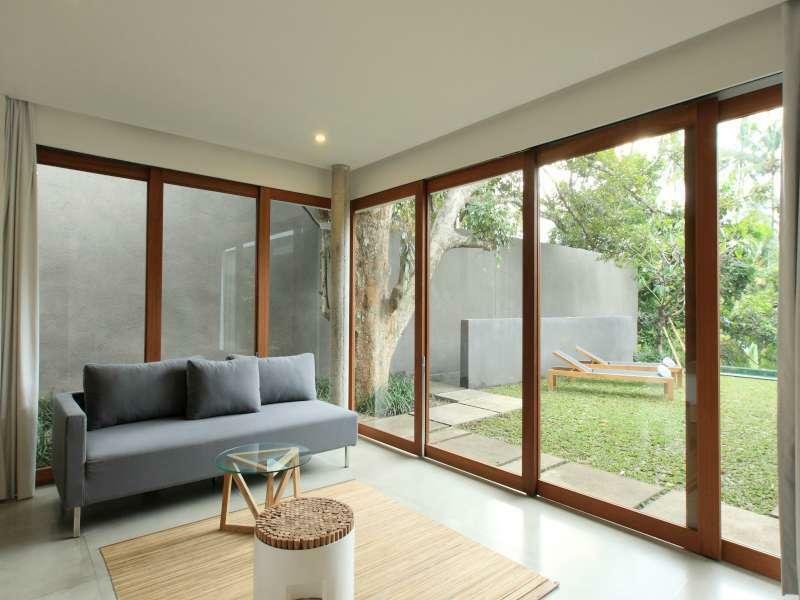 Will definitely recommend to others who look for something different, special, and minimalist in Ubud. Oh! their welcoming massage is extremely good and relaxing. What an amazing place tucked away so close to Ubud town center. The place is beautiful, well designed, peaceful and indulgent. I thought the staff were very caring, and the food was excellent! I loved my stay at Aria, and recommend Balik’s massages. We really couldn't fault anything at Aria Villas. The staff and service was incredible and the villa itself was stunning. We were in villa 3 on the terrace and I felt it would have the best outlook in terms of the jungle and the sunset. We didn't even have to leave our villa for a stunning sunset. Some people comment on having to overlook the roof of the lower level villas but we didn't even notice this at all. Our welcome was so impressive with refreshments and welcome massage - we felt like we had arrived in heaven. Great location, very central and close to the main street. The street you walk down to reach the main street can be quite hectic (as most in Bali) so be careful especially at night as there are many hazardous footpath holes/piles of dirt/rubbish etc... This is no reflection on Aria Villas but just something to be cautious of - we just hired a scooter through reception to get around. We had an absolutely wonderful time staying here. Book Aria - you wont regret it! Had a great stay at Aria Villas. We loved the minimalist lay out & the peace that comes from a private infinity pool backing onto Balinese forest! Complimentary breakfast was excellent & the location is an easy 5min walk to Ubds Main Streets. There’s also a complimentary gym 5min walk away and the staff were all lovely, particularly Made, who I assume was the manger, who really made our stay feel special. We will be back. This place is perfection! Everything has been taken care of here, you get robes, slippers, they even do their own toiletries. You get little treats every night plus the outdoor bathroom is just beautiful. The design is modern and seamless, the top two one bedroom villas aren’t as private as the bottom two but I wasn’t too fussed about that. The breakfast options changed almost every day and was really really good, they are small servings so you can order lots of little things and it never felt like too much. Staff were welcoming and kind. My only small complaint was that the WIFI was a bit hit and miss at times but it wouldn’t stop me staying there again in a heartbeat. The villa is amazingly beautiful, with everything you need, but it's the staff that make this shine. They are super friendly and go above and beyond to make you feel like a King and Queen, especially Made and Ita. Thank you for making our 10 year wedding anniversary amazing!